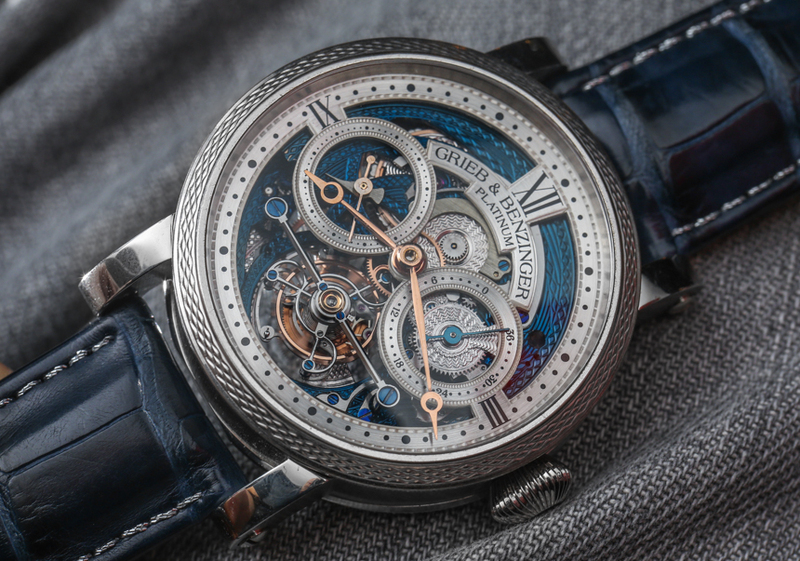 Back in 2014, the German team of Grieb & Benzinger that produces one-of-a-kind highly decorated watches debuted the “Blue Merit” (read our original article here) which was a lovely timepiece that began life as limited edition A. Lange & Söhne. I encourage you to read that original article about the Grieb & Benzinger Blue Merit to understand more about the original A. Lange & Söhne model whose movement is used for this ultra-exclusive watch. Inside the Blue Merit is a movement produced by A. Lange & Söhne which has been taken out of its original Lange case and thoroughly modified. It is the caliber L902.0 which, despite having come out in the late 1990s, is still super cool today. The tourbillon-based mechanism also features a fusee and chain transmission system along with a power reserve indicator on the dial. This layout helped A. Lange & Söhne develop a distinctive look as an early promoter of the tourbillon, and remains utterly classy and classic. A. Lange & Söhne produced just 50 pieces of the Tourbillon Pour le Merite, stopping in 1998, and the piece came in a 38.5mm-wide platinum case. I doubt collectors who own a Tourbillon Pour le Merite today are utterly bored with their timepiece, but at least one person (perhaps it was someone at Grieb & Benzinger) decided one of these limited edition A. Lange & Söhne tourbillon watches should be sacrificed in the name of horological art. I really do want to meet these people who have the balls to choose $100,000-plus (when they were new back in the ’90s) items as the base for a “project watch.” I suppose the question is whether or not the intense level of work by Grieb & Benzinger makes this little project worth it for the Grieb & Benzinger Blue Merit. 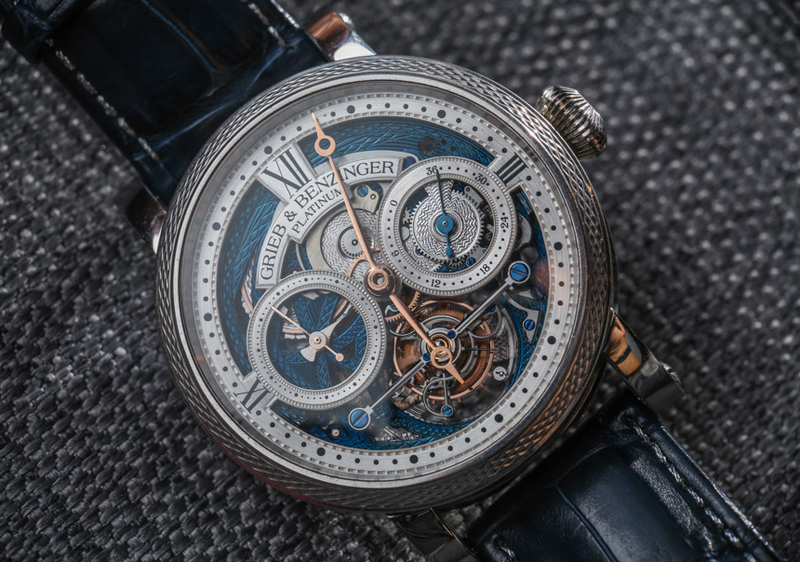 At 41mm wide, the Grieb & Benzinger Blue Merit is easily one of the smaller watches made by Grieb & Benzinger, but it still wears very impressively thanks to the tall case. Speaking of the case, I have to say that even though Grieb & Benzinger produce piece unique models, their cases are very nicely made. 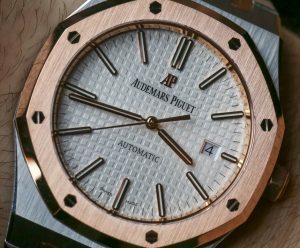 This is because they have a good supplier – and of course because they pay up, since getting one-of-a-kind anything made in the watch industry is ultra expensive. Note that this particular case is steel and not the intended platinum. 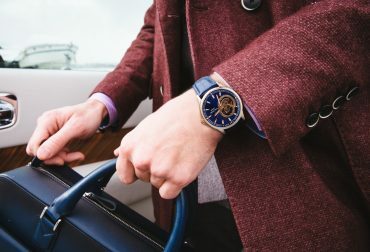 What Grieb & Benzinger do most of the time is produce both a precious metal and steel case for each of their watches so that when they travel with watches or show them it is less of a risk. 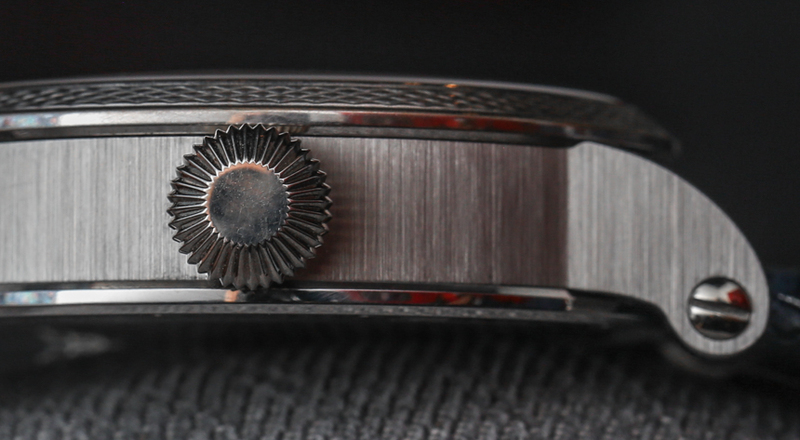 But even the “display” steel case is very finely made with excellent finishing. The workshop of Jochen Benzinger specializes in using antique engraving machines to produce some of the most beautiful guilloche hand-operated machine engraving around. 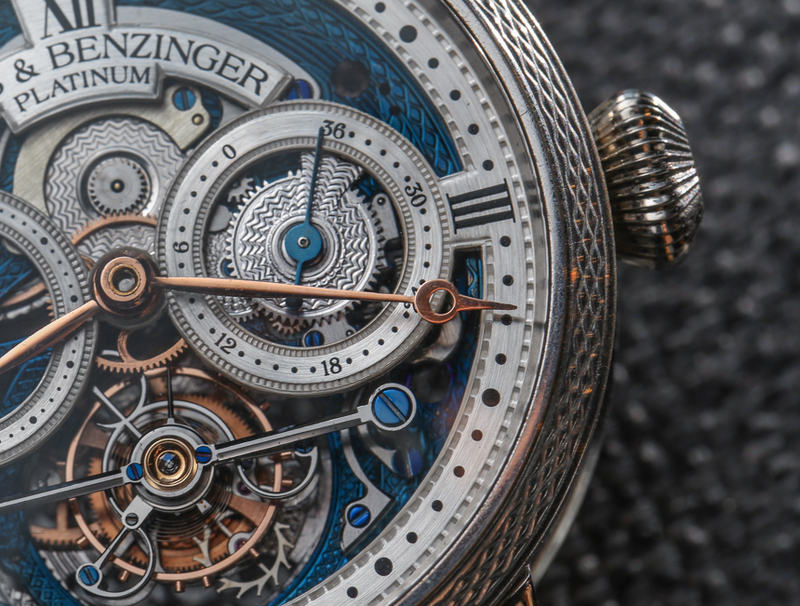 If you like artistic density and the look of guilloche engraving, then you really ought to love Benzinger’s work. 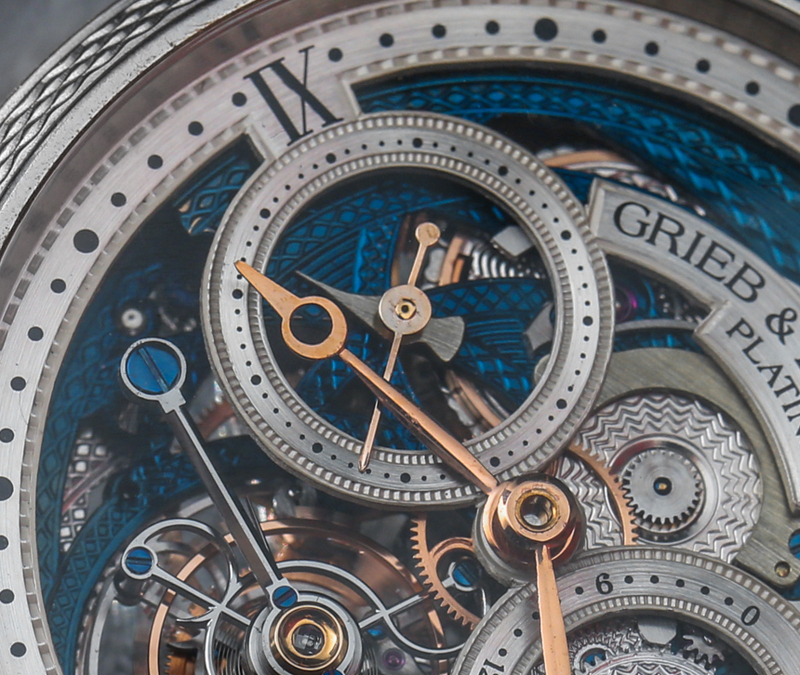 On the Grieb & Benzinger Blue Merit you’ll find engraving on the bezel, dial, and movement bridges, and pretty much everywhere else that it fits. 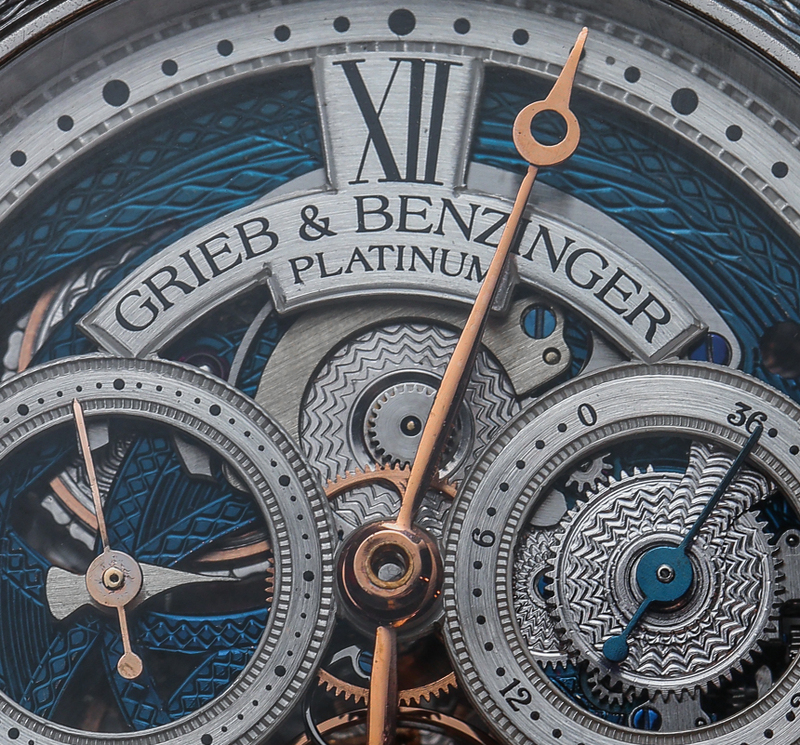 Grieb & Benzinger didn’t just take a naked movement and engrave it but rather specially colored and plated some of the parts to give the visuals a more dynamic look, mixing silver and blue colors with hints of brass. The blue is, apparently, “blue platinum” plating, which sounds interesting. When I first wrote about the Grieb & Benzinger Blue Merit, I only had the official images from Grieb & Benzinger to work with, so I was quite curious if the A Lange & Sohne Watches Uk was going to look as beautiful in real life. 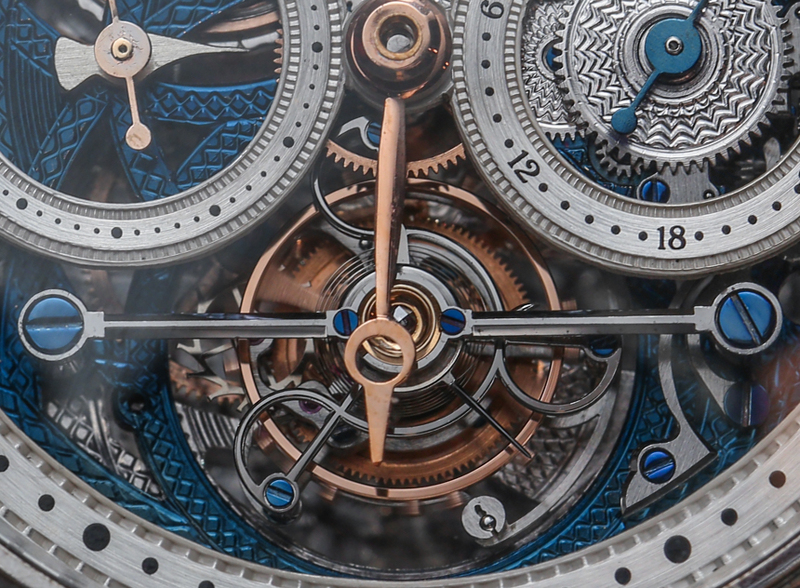 The first thing you notice when you see the Grieb & Benzinger Blue Merit or any other Grieb & Benzinger timepiece is that it feels as though the decoration was done “organically.” Yes, machines were used in the decoration, but it isn’t as though they are controlled via a computer. That is really the distinction between modern cutting equipment and historic equipment because the latter was hand-operated. 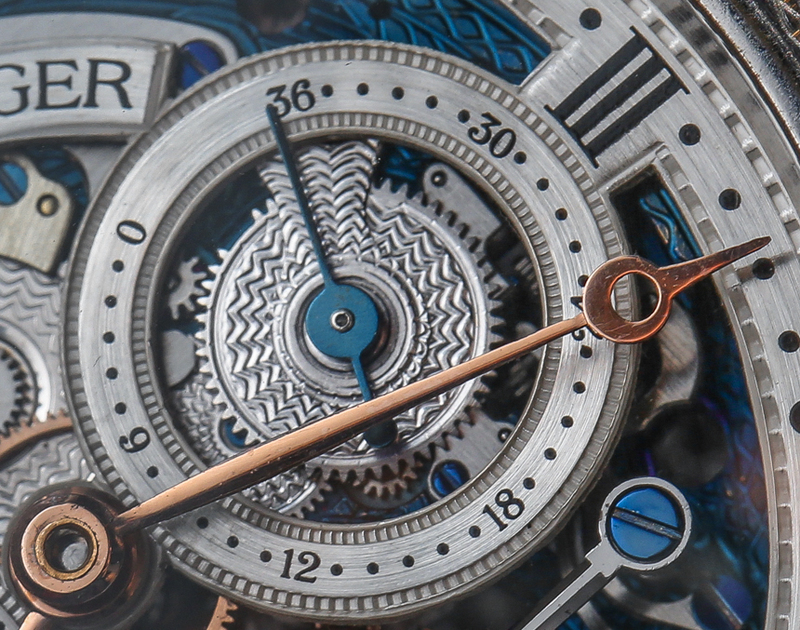 The Grieb & Benzinger Blue Merit mixes both direct hand-engraved decoration along with guilloche machine engraving with a very “hand-made” look to it. 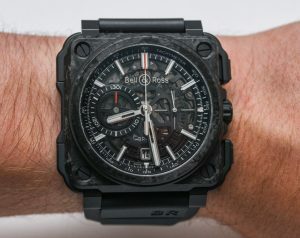 Such watches tend to have a lot of “soul,” which, in my opinion, allows collectors to connect with the watches more. To be honest, if you didn’t know that Grieb & Benzinger used an A. Lange & Söhne movement (or were really familiar with Lange’s products) you’d probably never know where the movement in the Grieb & Benzinger Blue Merit came from. 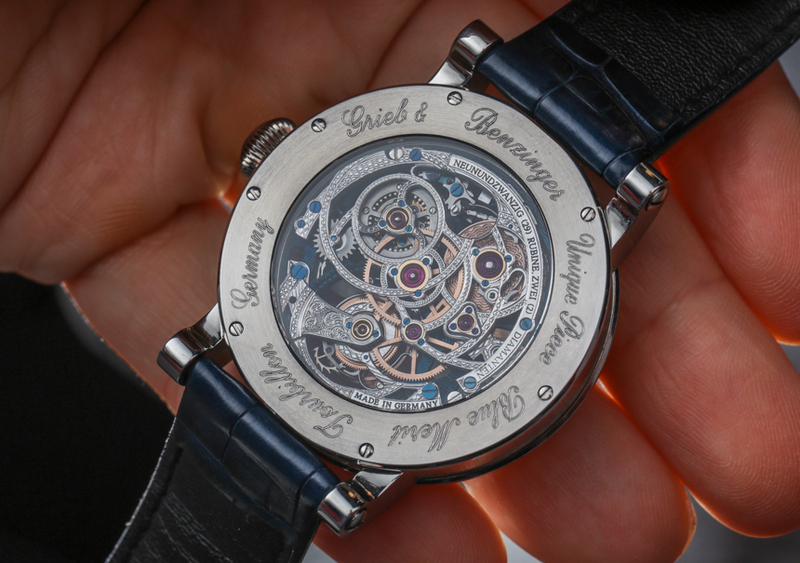 Grieb & Benzinger can’t exactly use Lange’s name on the watch for legal reasons, but the design of the Grieb & Benzinger Blue Merit is so radically different from that of the Tourbillon Pour le Merite that pretty much anyone would be easily forgiven for not knowing where the movement originally came from. The Saxonia collection represents entry level pricing for A. Lange & Söhne, and there are two variations of the Saxonia, one in white gold and the other in pink gold. In contrast, the 37mm guys’s Saxonia is priced at $14,800, (together with the Caliber L093.1) and the 40mm at $24,500. But neither of these have the tiny seconds or mother-of-pearl dial. Both the tiny Lange 1 Moon Phase and Saxonia appeal to different sub-markets from the ladies A Lange Sohne Glashutte 1 Sa Price market and Lange has presented some truly fantastic pieces.The Salon International de la Haute Horlogerie 2017 is now concluded, and the aBlogtoWatch group is predictably exhausted. We tried something new this year — a movie log (vlog) show — to help capture what it is like to be at the show. Combining high enthusiasm and energy-draining hours, we are glad people enjoyed that quite intimate look behind the scenes and exactly what it is like to attend the “world’s most prestigious” high-end watch trade show.In my 9th year attending SIHH (itself in its 27th year) I’d like to once more recap the overall sentiment of the series as well as point out crucial highlights which we think the general watch-loving public ought to be enthusiastic about in 2017. Before we reach our best 11 watches of SIHH 2017, I’d love to explore the general watch and luxury industry setting so that folks get a better idea of why specific products are being made — and for whom.It was a particularly cold and blustery week at Geneva, Switzerland, throughout SIHH 2017. Our lodging near Lake Geneva offered a first-rate view of what struck me as a acceptable metaphor for the industry’s current circumstance. High winds blew over the water inducing not just surfable waves (in case you have an Iceman-like tolerance for cold) but also spilling on the adjacent walking paths that from the summer and spring result in popular strolling paths for fans and languishers alike. The high winds and menacing lake waves seemed a fitting metaphor for the luxury watch industry which is continuing to experience a storm. What makes the Grieb & Benzinger Blue Merit somewhat more interesting is that, even though this is very much high-end horology, nothing about A. Lange & Söhne or Grieb & Benzinger is Swiss. Both companies are strictly German, which makes the end product of this “super luxury A. Lange & Söhne Military Watch project” even more unique since German timepieces don’t typically get this treatment. 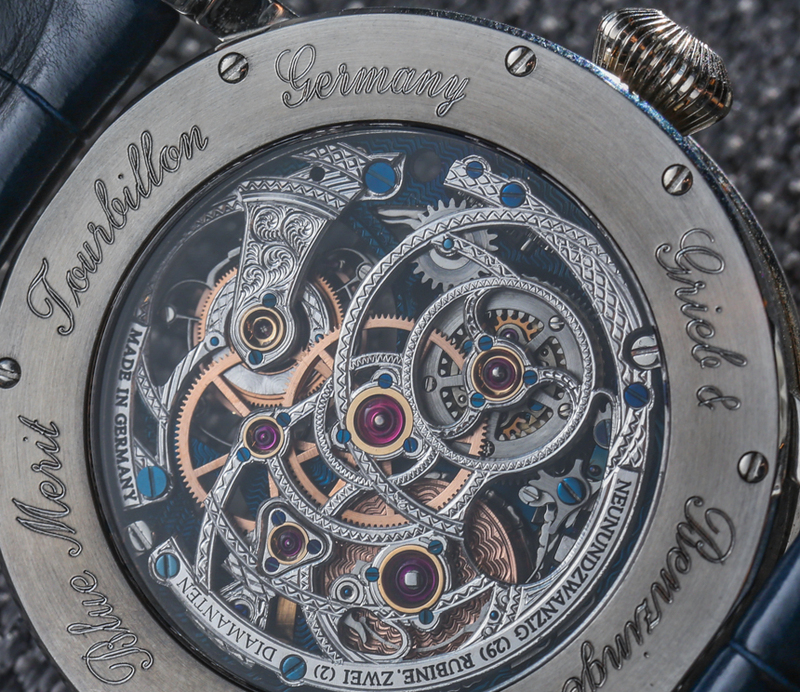 Moreover, most movements used by Grieb & Benzinger for their other watches are originally Swiss. 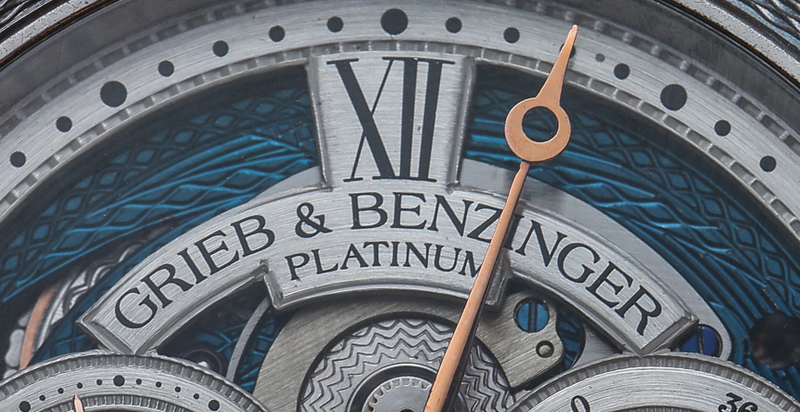 What the Grieb & Benzinger Blue Merit watch really symbolizes is how watchmakers historically demonstrated pride in their work. 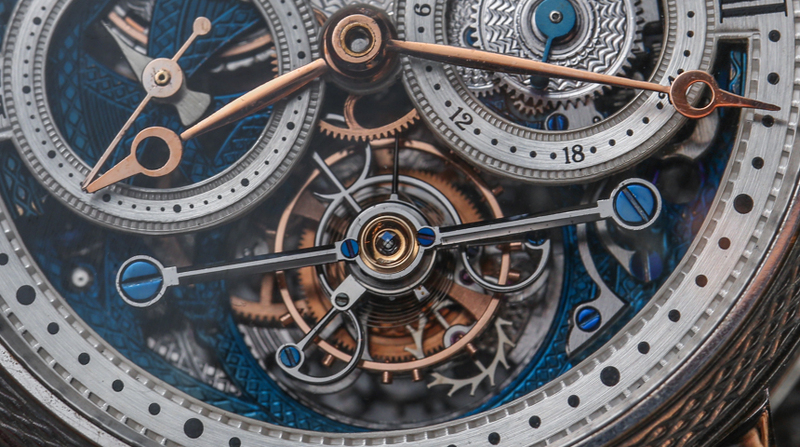 The time and effort required to make a fine timepiece was (and is) intense. So much so that watchmakers of old also had to become advocates of their own trade by visually asserting the effort and skill required to produce what they do. Engraving or otherwise decorating the visible surfaces of a watch movement or case doesn’t add any functional value – but is rather about conveying a sense of importance and prestige to items which required so much labor to produce. This is not only for the benefit of the buyer but also the watchmaker or craftsman who is allowed to benefit from pride in their work. This equal opportunity for the maker and the owner of a product to celebrate its value exists in the world of mechanical watches as well as some other items which are still produced in small numbers today by hand, in the shadow of their mass-produced counterparts. For these reasons, I believe decorated watches have so much aesthetic and monetary value to so many collectors.